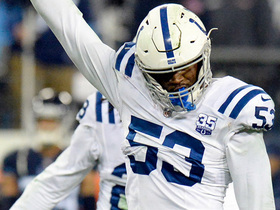 Jennings hauled in three of his five targets for 17 yards in Sunday's 33-17 loss to the Colts. Jennings caught all three of his targets for 29 yards in Saturday's 25-16 win over Washington. He also added one carry for two yards. Analysis: Jennings' three targets and receptions both represented season bests and his highest total in a game since 2015. Still best known for his prowess as a kick returner, he maintains no fantasy value as he has tallied only eight receptions for 84 yards through 16 games. Jennings was not targeted in the passing game but returned one kick for 29 yards in Thursday's 30-9 win over the Jaguars. Analysis: Jennings battled a knee injury throughout the short week prior to Thursday's game, but maintained his role as a kick-return specialist. He's been a non-factor in the passing attack, hauling in only five catches for 55 yards for the season. Jennings (knee) is active for Thursday's game against the Jaguars, Turron Davenport of ESPN.com reports. 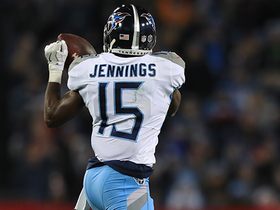 Analysis: Jennings will see most of his snaps on special teams and serve as the Titans' top kick returner during Thursday's tilt against the Jaguars. Jennings (knee) is officially listed as questionable for Thursday's game against the Jaguars. Analysis: Jennings is working to recover from a knee injury sustained during Sunday's win over the Jets, and his status for Thursday Night Football appears truly murky. 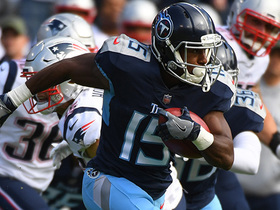 If Jennings were to miss any time, Adoree' Jackson would serve as the Titans' top kick returner. Jennings (knee) did not practice Tuesday, Jim Wyatt of the team's official team site reports. Analysis: Jennings appears to have suffered a knee injury during Sunday's victory over the Jets. 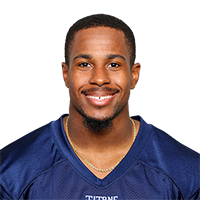 While he doesn't provide much to the team on offense, he has served as the Titans' primary kick returner. 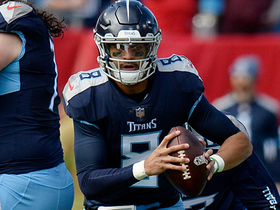 He'll likely need to get a full practice in Wednesday to have a strong chance of participating in the Titans' Week 14 matchup against the Jaguars on Thursday. Jennings is listed as a non-participant on Monday's estimated practice report, Paul Kuharsky of 104.5 The Zone Nashville reports. Analysis: Jennings appears to have picked up a knee injury during Sunday's 26-22 win over the Jets. 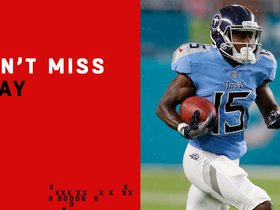 If the depth wideout were to miss any time, one of Adoree' Jackson (wrist) or Dion Lewis would serve as the Titans' top kick returner. Jennings caught his lone target for 36 yards in Monday's 28-14 win over the Cowboys. Analysis: Jennings caught a deep pass, splitting three Cowboys defenders down the middle of the field to record the longest reception of his career. Known mostly for his prowess in the return game, Jennings has just five targets on the season, making him irrelevant in traditional leagues that don't count return yardage. 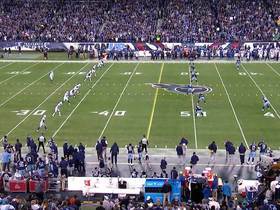 Tennessee Titans pull out tricky reverse on 41-yard opening kickoff return. 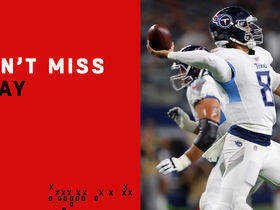 Tennessee Titans mimic the New England Patriots and quarterback Marcus Mariota catches a pass on this trick play. 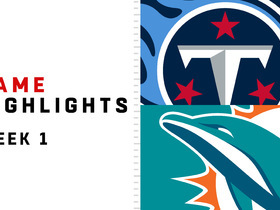 Tennessee Titans quarterback Marcus Mariota pinpoints pass to Darius Jennings for 36 yards. 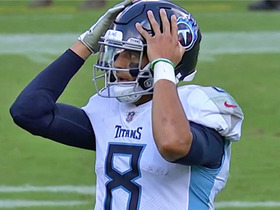 Tennessee Titans wide receiver Corey Davis drops an unbelievable deep pass from Tennessee Titans quarterback Marcus Mariota during overtime against the Philadelphia Eagles.